I am a fortunate person. I have had great disappointments in life that have been overshadowed by even greater blessings – that includes my husband, world-renowned rock guitar god, Conor Quinn, and our two beautiful babies. So, why does everything feel so off? My wife is slapdash and barely has her head above water but she still makes it all work, despite how she tears herself down over not being perfect. I think she’s an amazing mother. Until I come home one night to find her in a rare state. How am I going to fix her? 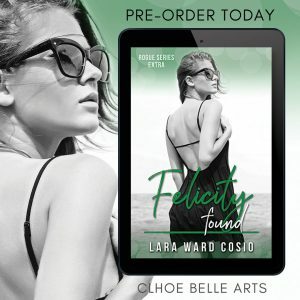 NOTE: Felicity Found can be read as a stand-alone, however a more thorough understanding of the characters and their backstories will be had by reading the entire series.